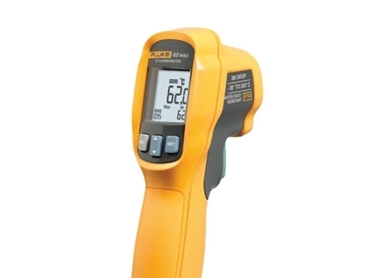 The new Fluke 62Max available from ECEFast is a range of unbreakable handheld IR thermometers featuring robust construction. The compact handheld IR thermometers have been drop tested to 3M while the IP54 dust and moisture protection rating offers long-term durability. This unbreakable range of IR thermometers is available in two models: Fluke 62Max and Fluke 62Max+. While Fluke 62Max has a measurement range of -30ºC to 500ºC, Fluke 62Max+ reads up to 650ºC with faster response, higher accuracy and new dual rotating laser sight. The new series is designed to deliver ease of use and intrinsic accuracy in rugged conditions. Both models have emissivity adjustment, max, min and average reading, and high and low alarms.